Today, Rcpp passed another milestone as 900 packages on CRAN now depend on it (as measured by Depends, Imports and LinkingTo declarations). The graph is on the left depicts the growth of Rcpp usage over time. The easiest way to compute this is to use the reverse_dependencies_with_maintainers() function from a helper scripts file on CRAN. This still gets one or two false positives of packages declaring a dependency but not actually containing C++ code and the like. There is also a helper function revdep() in the devtools package but it includes Suggests: which does not firmly imply usage, and hence inflates the count. I have always opted for a tighter count with corrections. Rcpp cleared 300 packages in November 2014. It passed 400 packages in June 2015 (when I only tweeted about it), 500 packages in late October 2015, 600 packages last March, 700 packages last July and 800 packages last October. The chart extends to the very beginning via manually compiled data from CRANberries and checked with crandb. The next part uses manually saved entries. The core (and by far largest) part of the data set was generated semi-automatically via a short script appending updates to a small file-based backend. A list of packages using Rcpp is kept on this page. 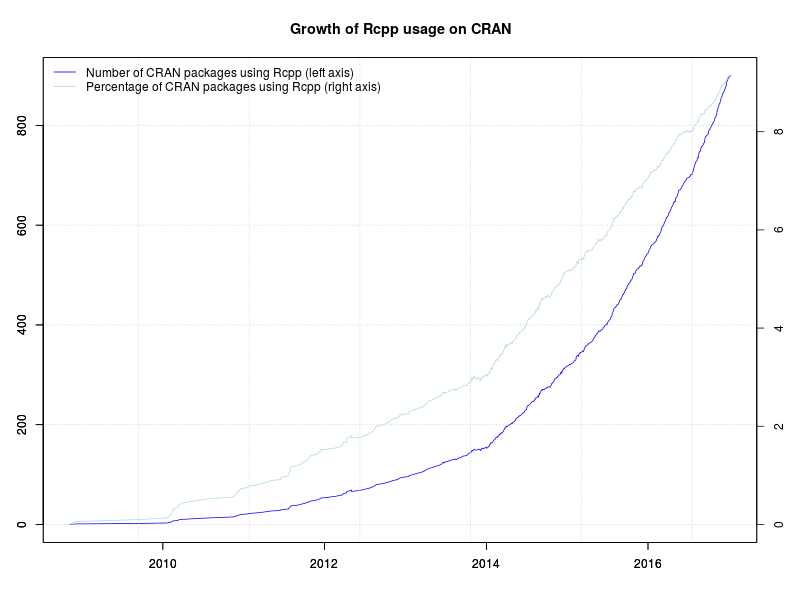 Also displayed in the graph is the relative proportion of CRAN packages using Rcpp. The four per-cent hurdle was cleared just before useR! 2014 where I showed a similar graph (as two distinct graphs) in my invited talk. We passed five percent in December of 2014, six percent July of last year, seven percent just before Christmas eight percent this summer, and nine percent mid-December. 900 user packages is a really large number. This puts more than some responsibility on us in the Rcpp team as we continue to keep Rcpp as performant and reliable as it has been. At the rate things are going, the big 1000 may be hit some time in April.